Members of the Texas House Higher Education Committee said they were worried about the rising cost of college in Texas, but stayed away from the criticism and dramatic calls for action heard from the Senate in recent weeks. Members of the Texas House on Tuesday took their swing at the higher education topic du jour in the Capitol this year — tuition. But compared with their Senate colleagues, the discussion was decidedly kinder and gentler. House members expressed worry over the rising cost of tuition, and they indicated a willingness to try to halt that trend. But they were more vocal about lawmakers’ role in the rising costs. And they were less confrontational with the university officials called to discuss the issue during a House Higher Education Committee hearing. "There are people in this building who say that tuition and fees are out of control and the culprit is out-of-control spending by universities," said state Rep. Chris Turner, D-Grand Prairie. "That is the accusation. I don't agree with it, but that is the accusation that is out there." Tuition was thrust into the spotlight in recent months after most public universities in the state moved to raise their prices. Lt. Gov. Dan Patrick included the issue on the list of items he wanted to study before the 2017 session of the Texas Legislature. And in a forceful news conference last month, Patrick chastised the universities for raising tuition by 147 percent since 2002 and urged the Legislature to consider taking back control of how Texas colleges set their prices. "What we are asking is for our universities to be as fiscally responsible as we ask ourselves to be and for our agencies to be," Patrick said during a news conference before a Senate hearing on the issue last month. "They are not an exception." House Speaker Joe Straus has also included college affordability on his list of items he wants lawmakers to study this year, though the idea of re-regulating tuition isn't specifically mentioned on his charges. On Tuesday, the House Higher Education Committee took up that work, but there were no news conferences or excoriations of schools. Instead, the tone was set right away when committee Vice Chairwoman Donna Howard, D-Austin, interrupted opening comments from a member of the Legislative Budget Board, who was noting that the Legislature increased funding for universities by 9.3 percent in 2015. Critics of the universities have cited that increase in recent months while expressing frustration about the schools raising tuition. But Howard noted that most of that money went to cover increased enrollment, so she said it didn’t represent that much of a per-student boost. “The actual increase in amount we provided the higher education institutions was only 3 percent,” she said. Plus, she noted that the state would have needed to increase funding by 17 percent to bring the schools back up to the per-student funding levels before major cuts in 2011. Committee members also cited the relative affordability of community colleges in Texas. And they said that while the cost of the state's top public universities, the University of Texas at Austin and Texas A&M University, is growing, it's still relatively low. "Our two flagships — A&M and UT-Austin — are frequently listed among the best educational bargains in the country," said Raymund Paredes, chairman of the Texas Higher Education Coordinating Board. The universities also insisted that they are working to keep costs down. Decisions to raise tuition are not made lightly, officials said, and they are often the result of the declining share of state funding. University of Houston System Chancellor Renu Khator told lawmakers that in 2000, the Legislature gave universities $54.44 per semester credit hour each student took. This year, after adjusting for inflation, that amount has dropped to $39.38, she said. "We are pedaling as fast as we can," said Texas State University System Chancellor Brian McCall. While lawmakers acknowledged the difficult situation, they also stressed that something needs to be done to keep college affordable. 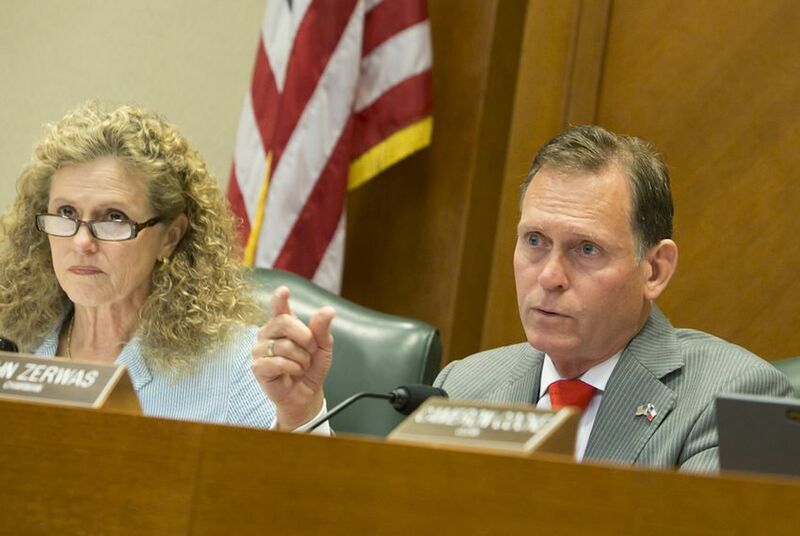 House Higher Education Committee Chairman John Zerwas, R-Richmond, said he often hears from people in his suburban Houston district about the difficulty of paying for college. And the next session will include difficult challenges in terms of K-12 school funding, Medicaid and perhaps less money to spend due to low oil prices, he said. Budget writers often look to higher education appropriations as a place where they can save money, he said. In other words, there will be a lot of pressure on universities when lawmakers meet in 2017, he said. "At the end of the day, whether it is politics as usual or what, there is a very strong feeling out there that the cost of higher education is spiraling out of control and out of affordability," he said. At the meeting, Zerwas highlighted one possible solution. In 2015, Senate Higher Education Committee Chairman Kel Seliger, R-Amarillo, filed a bill that would have banned universities from raising tuition unless they met a series of performance metrics. Those metrics would have been set by the Higher Education Coordinating Board, but would have involved graduation rates, success of first-generation college students and the number of courses taught by tenured or tenure-track faculty. The bill passed the Senate but died in the House. Seliger has said he plans to file it again in 2017. On Tuesday, Zerwas endorsed the idea. “It is an area that I think we will take a closer look at in this coming session,” he said. “I don’t think we really gave that the time and effort we should have” in 2015. Disclosure: The University of Texas at Austin, Texas A&M University, the University of Houston, the Texas State University System and Raymund Paredes have been financial supporters of The Texas Tribune. A complete list of Tribune donors and sponsors can be viewed here.